Also known as rice bran extract, rice bran oil is simply the oil extracted from the germ and inner husk of rice. It's similar to peanut oil, with high percentages of fatty acids—which, by the way, makes it a perfect skin moisturizer! Full of antixoidants, vitamins B and E, and wonderful natural emollients, this ingredient not only hydrates skin, but also protects. Rice bran oil is popular in Asian cooking because it has a high smoke point, making it suitable for deep-frying and stir-frying. It's often used for making good tempura, and is perfect for salad dressings as it combines easily with other ingredients without separating. It's similar to other vegetable oils, but has unique properties that make it appealing. These include its nut-like flavor and its nutritional value. Unlike olive oil, rice bran has mostly omega-6 fatty acids, which are great for skin. In today's Western diet, however, we tend to consume too many omega-6 fatty acids, and not enough omega-3s, so it's best to use rice bran in cooking in balance with other omega-3 rich oils like soybean, flaxseed and canola oils. Japan has used rice bran oil for centuries as a base for soaps and skin creams. The most popular health benefit of rice bran oil today is its potential to reduce the risk of heart disease—specifically, to lower cholesterol levels and blood pressure. In an age when our typical Western diet leads to problems like overweight, diabetes, and heart disease, cholesterol and blood pressure levels are often found to be at unhealthy high levels. Several studies have indicated that rice bran oil can significantly reduce cholesterol. In September 2012, for example, researchers found that people who cooked with a blend of sesame and rice bran oils had a significant drop in blood pressure and improved cholesterol levels. In fact, cooking with a combination of these oils worked nearly as well as taking commonly prescribed high blood pressure medications. In an earlier animal study in 2005, researchers found that using the specific type of vitamin E found in rice bran oil called “tocotrienol rich fraction (TRF)” lowered total cholesterol levels by 42 percent, and levels of LDL “bad” cholesterol by up to 62 percent. Previous research also indicated that the same type of vitamin E from rice bran oil may have potential as an anti-cancer and anti-infection agent. Research from Japan has indicated that another component of rice bran oil may be effective in relieving hot flashes and other symptoms of menopause. Researchers found that after taking a rice bran oil supplement for 4-6 weeks, 90 percent of participants found some relief. The main benefit of rice bran oil to the skin is its wonderful deep-moisturizing capability. This is due to its combination of vitamin E and fatty acids, which go deep into skin to hydrate. It's recommended as an alternative to the popular lanolin, so keep plenty of skin cream with rice bran oil around for those cold, harsh winter months. Concerned if you have oily skin? Try it anyway. Rice bran oil is light and penetrates easily, so it's not likely to increase the oiliness of your skin. 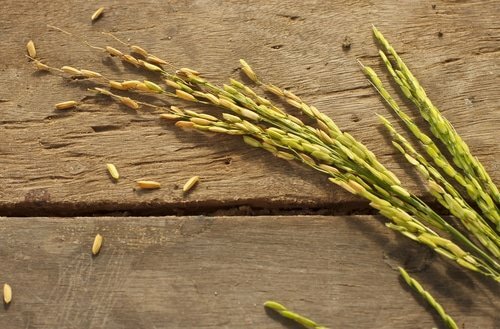 With all its natural components, rice bran oil is considered an anti-aging secret in Japan. It's actually a high compliment to tell a Japanese woman that she is a “rice bran beauty.” The natural vitamin E plus vitamin B help firm and tighten your look, maintaining hydration, which helps to reduce the appearance of fine lines and wrinkles. The benefits don't stop there! Rice bran oil has a slight ability to brighten the look of your skin, helping to reduce the appearance of dark spots and smooth skin tone. Antioxidants like beta-carotene and lycopene protect from environmental stressors, and enzymes like CoQ10 provide active components that help it maintain its youthful glow. Just try rice bran oil in these two products for 4-6 weeks, and see how your skin responds. You're likely to notice softer, smoother, healthier looking skin that has a more even tone. How do you use rice bran oil in your life? American Heart Association (2012, September 18). Sesame and rice bran oil lowers blood pressure, improves cholesterol. ScienceDaily. Retrieved November 22, 2012, from http://www.sciencedaily.com­ /releases/2012/09/120919190151.htm. University of Rochester Medical Center (2005, May 12). Can Rice Bran Oil Melt Away Cholesterol?. ScienceDaily. Retrieved November 22, 2012, from http://www.sciencedaily.com­ /releases/2005/05/050512110703.htm. Ishihara, M; Ito, Y; Nakakita, T; Maehama, T; Hieda, S; Yamamoto, K; Ueno, N (1982). gamma-oryzanol on climacteric disturbance. 34. 243–51. PMID 7061906. Maybe your next article research could be on canola oil…? Where can I purchase this bran oil in the Us. You should be able to pick it up at whole foods or your local health food store. If not, you can certainly order it online. i have recently started to look into rice bran oil and was thinking of making a small factorie to produce and export it. does any one no what company in the town you are in would by it ? Rice Bran Oil is a gift from nature. It is anti ageing, low bad colestrol & improve good colestrol, maitain sugar level, reduces calcium density which is helpful for goid bones, high smoking point, 10%-20% less absorbed and can easily digest. i just want to know where it is available in toronto canada , and what is the name of the shop. I have been using rice bran for about 20 years and I love the anti aging qualities and how soft my skin is. I recently started a soap company and I use rice bran oil in my soaps and the result is an amazing thick lather that leaves the skin feeling hydrated. I love the stuff! Excellent news Rod, don’t we all (secretly) love to be told we are looking good? And of course you really know it’s working when others notice it too. Thank yu so much for sharing, make it a wonder-filled day.